My jaw is still on my desk. Perhaps the financial collapse was Greenspan’s road to Damascus and he’s preparing to evangelize for a safer/saner financial system. I’m not particularly optimistic that Greenspan will turn out to be the financial Saint Paul, but stranger things have happened. If Greenspan has suddenly seen the light, then perhaps he can start by throwing his weight behind someone who has been a long time champion of the cause. I suspect Greenspan knows that Obama will never, ever touch this topic, so Greenspan can safely have it both ways. They often get responsible after leaving power. I seem to recall Kissinger did this kind of thing. Amazing grasp of the obvious. And, just why is it that we violated the law and refused to apply the mandatory PROMPT CORRECTIVE ACTION required when the too big to fail banks and other financial service institutions became insolvent? If we had done so, these institutions would have been broken up. Over a year ago….. I wonder if Greenspan is a bit bitter? He was, after all, betrayed in his core beliefs. Punked, if you will. He made a lot happen for the ‘big guys’ and they simply turned around and asked for more. It doesn’t shock me, but it may have shocked him. I first read “Greenspan” as “Greenwald” (as in salon.com progressive blogger Glenn Greenwald) and sat for more than a moment trying to understand why Kwak’s jaw had dropped. The moment I realized my error, “thud” went my jaw. This makes complete sense in light of my comment on the previous post. It looks better to break them up, and they end up making more money anyway. No need for jaw-drop; it’s completely consistent. Why did he ever think the sociopaths on Wall Street should be trusted to begin with? That is what I will never understand. Amazing. What a hopeful way to begin the weekend. This interview below is separate from the Bloomberg story James is referring to, but still interesting. In 1962, Greenspan wrote an article entitled “Antitrust” panning antitrust as misguided and unnecessary. He noted that he was “indebted to Ayn Rand” at the time. I wonder if he is cursing her now. I doubt it. Any company that received alphabet soup aid should be torn limb from limb. This will go a long way to repairing the capitalist machine!!! Either Pimco has made a strategic shift out of Financials, or Greenspan is about to lose his cushy consulting contract. I’m giving Alan Greenspan the Henry Kissinger “Fighting the Fire I Started” award. I’ve never had illusions with people like Greenspan, all ego no conscience. He must be bored that nobody gives him any attention. Another sign of serious sociopathic behaviour. What a steaming pile of crap this detestable little slug is. After having practically insured the collapse we’ve all just experienced, we now have penitant on our hands? I mean, really! Exactly what value has there been to the professional life this eel has led over the last several decades anyway, the insertion of impression-creating cliche’s like “accomodative” into the lexicon? Sure looks that way, doesn’t it? Why even give this filth a platform? Better that he be held, interrogated and given a public trial. StatsGuy, how can anyone listen to Elizabeth Warren on this video and not come away believing that the error in our ways is far more fundamental than any that is being discussed on this blog, or anywhere else that I know of. Most charts show things going real screwball in 1980 or so. That date marked major changes in how banking systems were reorganized to become the screwed up monopolies that they are today. But 1980 is also when the microprocessor driving software took control of the rules for doing business. I know because from that date on the accountability of double-entry book-keeping, which I have studied in detail, has been lost. We have no accountability because accountants, auditors, CFOs don’t know the difference between a debit and a credit. And they don’t know where to ask because the confusion is programmed into software code that even the software developers do not understand. In fact James’ Ariba is one of the companies I watched with interest while the President of this fraud took a 1/4 of a billion dollars out of it in one year. Ms Warren is amazed, asking in a general way about the state of affairs: “How can this be?” It can be because something more powerful than atomic bombs has been unleashed to disrupt a normal political control process. That something is software itself. Business software is written by mercenaries at the purchased request of venture capitalists. Our leadership does not understand it even enough to know how it causes its damage. Greenspan saw in it productivity, which it certainly does have. I love my computer for designing building. I love my email, my cell phone, text messaging. When Greenspan was on the board at J.P Morgan he read reports whose book-keeping was still being supervised by elderly ladies of ms Warren’s intellectual caliber and integrity. But in the 2nd Millennium when Greenspan did his greatest damage those reports were being generated by bogus book-keeping software. Greenspan needs to rethink his own life’s experience, and how he read the colossal changes that took place in those years. He and others need to figure out just how he got duped. And finally, to James, could Ariba have been the fraud at the level that it became if it had a transparent book-keeping framework or rules keeping its books? Who would have made these foolish bets if there had been even a degree of transparency? Yes. Greenspan is getting blamed now. He rehabilitates his image, and since he was so wrong for so long, no one listens to him. It would appear that the political class is beginning to show publicly a loss of faith in the country’s financial elite. Such a fissure opens the possibility for genuine change and avoiding the fate of post-WWII Britain for the United States–a slowly congealing national economy left in the dust of more energetic foreign competitors while a torpid financial services sector feathers its own nest (and fouls the national water supply). This comment is pretty funny if you imagine that it’s Greenspan that wrote it. What about being found guilty and sentenced to work in a chinese factory for 50 years? My jaw did not drop. But there needs to be the political will to accomplish what Greenspan now concedes to. Relative to book-keeping, how well the data is entered is important, but there is a much larger issue at stake today. We have had 30 years of badly distorted social practices. Meanwhile we have economists running the country with models that project assumptions drawn from a corrupt set of economic practices. Probability assumptions and projections have a slim chance of finding a way to correct these distorted social patterns. A proper book-keeping is a real time model. Using it give us a chance to know what is actually going on distorted or not. One example: how much of the economy is running under the table. It used to be that a store or a restaurant would have an extra cash register that is not on the books. In recent years I have seen whole construction projects run off the books. I’ve heard rumors of persons having been doing this for years. I know a non obvious reason why they do it: because the business would fail if it tried to meet the costs of being a legitimate enterprise. In many cases it is being done as a matter of survival There are any number of exceptions of this type that economic data does not taking into consideration. Another issue is that book-keeping, being a real time model, uses language patterns that reveal a genuine social science. That science is presently lost in confusion. If you go to the I Ching and look at hexigram 41 and 42 you will see that Chinese mythology knew of today’s type of economic failure 4,000 years ago. They call the patterns “increase” and “decrease.” They study the relationship between economic value and rights to value’s ownership. To much focus on value brings a culture to a stalemate. Too much focus on ownership rights leads to a pattern of feudalism. Clearly, we are in a pattern headed for feudalism. Fake money has bought up the culture’s value. The fake money has bought up things that it can’t support because the fake money that took possession has no contributed value with which to support the maintenance of what has been stolen with fake money. The list goes on and on. Our culture has to return to basics, to learn how a social system actually works. The book-keeping template — 670 years old — is the best social science template that we have. “Too damn late to the party, Al” is all it leaves me thinking. The bad guys already won. The damage has already been done. And if it’s absolution for his actions he’s searching for, I doubt anyone will be so generous. Go dig yourself a grave and fling yourself in it, Greenspan. You missed your chance to fix this. Nobody cares what Greenspan thinks anymore. He’s nothing but a backbencher now. So we break up the banks… in how many pieces? 10? 100? And then what? What are we to do with our jaws on the desk? Of course we are all better off if banks are smaller and more manageable, specially the banks themselves, but though I have been saying that for the last decade that does not mean I have believed for a second that that would do it. At this moment to focus on the TBTF issue is to me in the best of scenarios like fixing your drawer when you do not know what else to do, and at worst, pure diversion. Out there, on main-street, the unrated entrepreneur, he who we all really depend on to get us out of the mess, is having an extremely hard time because our regulators, almost two years into the crisis, keep on favouring anything dressed up as low risk as if nothing has happened. I checked Google News and The Atlantic Wire to see if Greenspan’s new found radicalism was deemed newsworthy. Apparently the mainstream media have totally forgotten about him. Since the MSM treat him with so little regard, I was thinking that maybe Baselinescenario should extend to him a magnanimous hand and invite him to write a guest post so that he can expound and share his new ideas with what will probably now seem to him a pretty large audience. Of course we shouldn’t expect of him the quality of penetrating analysis and incisive style StatsGuy and BondGirl accustomed us to, but, maybe in his quality of insider during the bubble years, he has a few interesting insights to contribute. sounds like a slightly more violent brand of Greenspan. Gosh, that is soooo true. Thank you. Alan, like many (most forgotten) has had his 15 minutes of fame times a hundred. Maybe he’s just tired of not having the stage any more. He presided over all of the recent bubbles, and, it was less about Fed policy than the tone he set (being a Randian and all that) that caused the freakish crap that happened during his watch. But mostly he changed the morality status of greed. What used to be a sin, is now (even for televangelizing Christians, sadly) now what will apparently qualify you for a jihadists award on death. Dan, I’m not sure if you’d be interested in this, but there is an area of computing where programs come with logical proofs that they satisfy, for example, the principles of double-entry book-keeping. These languages are used to develop proofs usually where human lives are at stake (e.g. airplane computer controls), but could be used for anything. You could probably find someone proficient in one of them to partner with in making verifiably solid accounting software, and selling it on that basis. Just an idea. As Simon has said, we have committed a Rahm faux pas by not using the crisis as our opportunity, but then why do it now, since the antichrist Paulson and his cronies Geithner and Summers have effectively wasted the opportunity for us (of course with a compliant Congress and President). This can still be accomplished if we could find enough support to reinstate The Glass-Steagall Act, which would effectively break up the big financials. Otherwise, death to our economy and the middleclass, we’re about to become the underclass of Russia under Communism after Stalin (where the apparachiks were able to creat great wealth for a few, and most lived in abject poverty). When is our media going to represent true public opinion? The answer, never, so long as the economy limps along and the plutocracy is the only one to pay the bills. I note a lot of people castigating Alan Greenspan as if he were some sort of mass murderer. On what basis, I wonder? The claim that failure to tighten monetary policy caused this recent bubble and the damaging fall out is FAR from proven. To add “Faulty monetary policy” to this list you need to put together a very strong argument that says (i) Central Bankers could plausibly have raised interest rates, (ii) if Central Bankers had raised interest rates, it would have been effective at preventing the crisis, (iii) Central Bankers can reasonably be expected to have seen that this was the optimal response. I haven’t see any proof of any of these yet, and I think plausible a priori arguemnts could be made against all of them. Finally. Someone that “gets it”. – the lure/the seduction of software of course comes because once in a while a program came along that was heaven on earth and made things better, safer etc etc in short exactly as perfect as they should be (and consequently in the not so long run will cost qualified jobs because you then will need only one hyperqualified paralegal who watches that the program keeps in synch with legislation and office procedure in synch with the program. and the dream of any consultant trained manager will become true that he can replace his former crew of well-qualified savvy paralegals by “hirnamputierte Knöpfchendrücker”= brain amputated button pushers. I love to read your posts and if I’d to vote on anything I’d vote on your proposal because going back to a system anybody can understand with just paper and pencil but which is at the same time capable of keeping track of unending complexity looks like a very good starting point. But as you mention I Ching I guess you are a bit into things Chinese – I know very little about their history but am endlessly fascinated by this successful admiral they had which they for no reason anybody seems to know of stopped making conquests and stopped themselves becoming a sea power. Greenspan is one of the High Priests of the whole criminal ideology of rigged-market fundamentalism and deregulation. His moral authority and therefore culpability goes way beyond his technical culpability in failing to exercise Fed oversight authority. how do you propose to get your view into soundbites? I have subscribed to the podcast of Katie Couric’s notebook – the pieces including their framing are 1:02 long and she usually manages to get a point across – how could that work with your view? you can tell a ship wreck drifting towards an island on the cabin door that it’s either onto that rock or getting slowly dehydrated – how do you replicate that in the economy when just so many people have been impaled BECAUSE they have taken presumably sound advice? For me, the disappointment I feel regarding Greenspan centers his encouraging “alternative investment vehicles” and believing the financial institutions would “self-regulate” because he felt it was in their best interest to do so. Banks will be banks. – As Johnson has pointed out so many times. It is their job to make money for the stock holders. Greenspan helped shut down Brooksey Born. Greenspan helped pave the way for de-regulation. We needed Congress and those in charge to protect our country from the bankers – they didn’t. I feel Greenspan is trying to shed a positive light on his career at this point and he no longer is credible. I think the mistake is to believe that one can only get something out of these people if one knows their language/business, I say no, that’s not so, let them explain it as double entry book keeping on little T-accounts with just a pencil – only by insisting on something like that can you scale them down to size. You may even do it very respectfully and deferentially they will still probably have lost their clothes at the end and if not then you may have found a beacon to follow. Over here all the media were swooning with hyperbole admiration for Greenspan’s oracle of Delphi style like talking while I went what??? and what????? after all somebody talking like the oracle of Delphi can never ever be nailed down as having stood for something – but he certainly gives a lot of business to “experts” who can then make a buck explaining his probable meaning or not-meaning to us stupid ones. Sorry about the spelling error..Brooksley Born..
Those supposedly lower risk loans or investments, to whatever carries an AAA rating, those which require banks to hold only 1.6 percent in equity, those had everything to do with causing this crisis, and have absolutely nothing to do with getting us out of this crisis. Those supposedly higher risk loans or investments, for instance to unrated entrepreneurs, those which require banks to hold 8 percent in equity, those had absolutely nothing to do with causing this crisis, and have everything to do with getting us out of this crisis. And so, since we must increase the capital requirements on the supposedly lower risk or investment, in an economic environment where bank capital is hard to get and very expensive, little by little until there is no longer any regulatory arbitrated risk discrimination, I would meanwhile partially compensate it by temporarily lowering the capital requirements, for those supposedly higher risk loans or investments. Now in order to propose and accept something like this you need to understand what really happened and that is not really what most currently debating the issue are interested in. Does this add up to an understandable 1.02 understandable soundbite? I’m right there with you James. How did we figure this out so long before the great guru? Lets just spell it out: Mark my words – this is the fair warning that the big banks are so insolvent that they are taking in so much over the transom that no amount of bailing is going to save them. Plan C is being revealed. Which is the greater evil – being “big” or the corporate welfare fed to financial institutions by the Federal Reserve through near zero interest rates , at taxpayer expense. All good points, Talkingcat. And the general media — after at least a year of post-mortem forensics on this website (and others) — is finally putting together a coherent narrative (see above link). … Talk about harnessing the collective IQ and expertise of experts via the blogsphere … but that’s another story. The real story here is that the complete perversion of the financial markets’ allocative apparatus finally has percolated up to the collective consciousness. That this transmogrification of capitalism has elicited the rebuke of the Arch Champion of Ayn Rand’s Objectivism is truly significant. Remember, this is the central banker feted throughout the world upon his retirement as possibly the greatest central banker in the history of modern finance. The next step in this evolution is upon us. Now we see what action the government — duly elected and constituted — and its executive apparatus takes. If they do something along the lines Greenspan suggests, and we do get another TR moment that successfully rights the markets — i.e., makes them open, fair and efficient — history will mark this era as truly significant and laud those who ensured the evolution toward greater freedom progresses. If nothing substantive happens here, we will know we are the transitional generation toward a darker, more brutish future. We will know that, once again, given the historic opportunity to confront an emergent oligarchy our leaders chose instead to side with them and enrich themselves. Our children will inherit a society and government controlled by those Hobbesian brutes, who, once again, will have demonstrated a few will always be able to run rampant over the many, and that this mute horde will be compelled to underwrite and defend obscene excess. The word’s out. Now we see who sides with whom. We see if Burke was right. 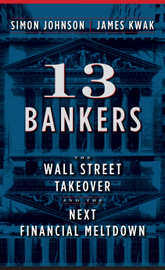 “Banks will be Banks” Is that a corrollary to “Boys will be boys”? does that give you any ideas for how to use/incentivize banks? Boys have parents to teach them right from wrong and steer them in a productive direction. Yes, Silke, but to prove book-keeping, one must first relearn what book-keeping is designed to accomplish. And that is what has been lost over the past 30 years. Our leaders do not know. Here’s a simple test: if you know an accountant, auditor, economist, banker, etc, ask the person for definition of the word “debit” and “credit,” two fundamental features of how book-keeping records a transparent and reusable history. Report back those definitions and I will give you the correct definition. Do the same with the terms “debtor” and “creditor,” or “assets” and “liability.” You will quickly see why our financial world is in tatters. This language — the only language — that is designed to control commercial is lost on today’s business culture. Our leadership has not a clue what the language did 50 years ago, when I learned its universal data model in a General Electric Division. Keep in mind that book-keeping is not an invented language; it is a refined social science. You are reading into charts like a fortune teller reads into one’s palm. – Claiming that “accountants, auditors, CFOs don’t know the difference between a debit and a credit.” is sheer baloney. – Programmers are no less mercenaries than any other service provider. – The implication of software in banking business is no different than the other industries, yet the latter haven’t caused a financial crisis. In reading your comment I see a Big Ball of Mud. My interest in I Ching traces to my need to understand binary language. Double-entry book-keeping is (1) a grammatical language, and (2) a formal language. Formal grammar is a binary language where subject|predicate relations, recorded as book-keeping transactions form a grammatical statements as binary sentences. A journal of formal grammatical sentences, when posted to a ledger form a story object as ledger report. The Balance Sheet is such a story object where the subject matter is the assets in the care and control of entity. The Chinese produced the most concise rendition of classic grammatical stories. What often scares the Wester person, as well as the modern Chinese (their technology was lost 50-60 years ago as well) is the use of metaphor to construct story classics. A user of language such as I Ching has to learn the language of metaphor used by each I Ching author. Few among us want to bother to learn any language new to us if we do not see a quick and simple reason to do so. That is how Microsoft has maintain its lead by using less than well refined code. About the Admiral I know little. I believe I read a story about it somewhere but that is all. I don’t know any such people any longer “accountant, auditor, economist, banker” so I’m afraid you have to give me the definition without their help which I would love to read and learn because my answer to all the other questions you asked is “I know it when I see it” and I can kind of prove it because I remember well how furious I got when our federal agency where I keep my state papers, i.e. money I lend to my government, changed its name from Bundesschuldenverwaltung=federal debt administration to Bundeswertpaperverwaltung= federal value paper administration. The presumption of it drove me up the wall I lend them money and they claim verbally that my paper proving that they owe me money is an asset for them? btw the congress woman in that Bill Moyers talk with Mr. Johnson which was discussed all over this blog told a very similar sounding story from Washington. cityislander, I am accusing accountants et al of not knowing the definition of these words in a formal book-keeping. If you know these definitions please share them to show how incorrect I am. Unless you’re simply capitalizing on human’s nature weaker bent to sometimes side on the irrational so as to make a bit of sensation on this forum, then the burden of proof lies on you to support the claim that you have reiterated as well as all the other outrageous ones you have previously made. If the premise of your claims is Warren’s video then you should listen again, and take her words at face value when she says “The reason we will get a full accounting is that we never asked”. As an accounting ignoramus with a curiousity about the subject and the desire to learn it correctly, I would like to be told what a debit and credit is and how it is currently being misused simply for my own edification. I think the point is that Greenspan had options _other_ than raising interest rates. Among them, he could have simply thrown his intellectual weight behind the notion that the emerging housing bubble was real (rather than arguing that bubbles, but definition, do not exist because the markets are efficient). Alternatively, he could have taken _other_ actions associated with bank reserves, bank auditing, credit risk auditing, etc. Instead, he validated the actions of the risk takers. So while the causes of this crisis are multiple (isn’t that the case with every perfect storm? ), Greenspan surely merits his share of blame. Just out of curiousity, how did you know they were claiming it as an asset for themselves? One could also add that it’s not just about reducing volatility but also lengthening the investment horizon and therefore shifting the participant’s focus from second guessing the markets to fundamentals, whether at the macro, or at the level of individual company stocks. I wonder, though, how high it should be set before such a change in behavior kicks in, but have heard there are successful examples in Latin America. Any research on this? A sufficiently high tax would take a lot of parasites off the market : as Nassim Taleb would have it, analysts on the sell side feed stories to the buy side that are of little value for prediction’s sake, but satisfy their need for finding structure in chaos. If some brokering houses have the power to actually set trends, it is questionable whether these are genuinely anticipative or are simply designed to generate brokering transactions. I recall an influential Telecoms analyst at an IPO luncheon who told his audience that if he were to give us his blue sky scenario for the company in question, we would have to restrain him in a straight jacket and a mask over his mouth. That was a couple of months before the telecoms bubble burst… about a decade ago. When you think about it: 1) At best unnecessary services driven out of the industry (hence more capital for other entrepreneurial pursuits) 2) Less of a need for stringent regulation. Conservatives should beg for a Tobin Tax. I wonder who your response is targeted at. Those who at this point would have to yet be convinced that he shares some blame are either born yesterday, brainwashed, or have ulterior motives. For the others the more interesting question, are the precise circumstances and cognitive weaknesses that induce a leader to fall victim to the sort of misguided beliefs, which he partly recognizes in hindsight, that are usually perceived as confined to the cult-culture. Is he isolated, or is this actually pervasive in high level government, society at large? I lost track of who this question is directed to, so if it is to me, I am arguing that, yes, book-keeping software is being programmed incorrectly. I’m also arguing that accountants, auditors, economists, and bankers are not picking up the programmers errors because they themselves have lost track of how the book-keeping framework is properly implemented. Asking an accountant to define a debit or a credit is like asking a mathematician what an axiom, or a function is. If the math guy cannot answer this simple question, then he does not understand the discipline that his title claims that he understands. I have been asking these questions for years of accountants, auditors, etc., and have not gotten an answer that is even close to the facts. So I assume that book-keeping in large banks is foundering. Those who find an advantage in cheating are free to do so. Another clear test of a breakdown in professional standars is to ask how a bank can deal in derivatives without an understand of double-entry book-keeping. I say that because a derivative is clearly a gambling bet. A bet is not a commercial trade transaction, therefore there is no way to post a gambling bet in double entry book-keeping. Yet, there are thousands of derivative transactions taking place. Therefore it is safe to assume that banks and Buffett selling derivatives are not using a proper double-entry framework of rules. I spent 10 years with software developers many of whom were writing accounting programs. Not one person had the slightest clue as to how the 670 year old double-entry framework of rules works. So far as economists are concerned, if they are going to project images of trustworthy models, by using initial data largely derived from book-keeping data is inaccurate, how can their economic data be trusted? Therefore it seems to me little wonder that we are in the serious financial melt down that we are in today. Bad book-keeping that is buried from view in abstract software code simply does not have the scrutiny that book-keeping had before 1980 when there were lots of book-keepers still working with pencil and paper. This legion of workers kept the professional standards honest. They are no longer with us. Therefore this problem must be fixed. Are you of those people who think that an argument can be won by repeating it ad nauseum? No matter how many variants of it you propose it is total nonsense. So by your standards, therefore, borrowing money and owning a stock cannot be posted in double entry-book keeping. Do you get a kick out of this? You know when I read Dan’s comment at first, I thought he was talking about off-balance sheet hiding of losses. Finally realizing that a fiction novel (Atlas Shugged) is perhaps not an appropriate basis on which to structure an economy I guess. Cityislander my claim is that our leadership does not understand book-keeping as control code. I am intentionally choosing between two tacks. One would be to give you the definitions in an open forum making it more difficult to know the present state. This would be noble and fine. However, a more powerful tack would be to gather some raw examples of what our leaders do know about these simple words without the benefit of my hint. I believe our nation is in an extremely precarious position. The second tack is more to the point of the error as I see it. I know the likely answer because I have been asking it of accountants, auditors, and CFOs for the past 30 years. In that 30 years the definitions have become increasingly inaccurate. Because book-keeping is now hidden in software code that even the software developer does not understand (I know this by having attended there conferences for 10 years from 1994-2004.) our culture is being dumbed down by lack of exposure to the hard facts that are essential to book-keeping as the de facto language of commercial trade. Those facts are today hidden in bogus software code. A little professional testimony would go a long way toward making it clear as to why this code needs to be reexamined, and quickly. In 1494, when Luca Pacioli documents the then 150 year old book-keeping language, his ledger columns are labeled “Debtor” and “Creditor.” No minus sign is in use. The debtor is the entity that brings the artifact to market in trade. The creditor is the entity that takes ownership of the artifact in exchange. Where debtors trade their artifacts for cash value, creditors exchange cash for capital rights to the artifact’s ownership. Debtor-value is a numeric measurement that interprets behavior as work versus creditor-rights that are alphabetic expressions that compile rights into a composition of ownership. Measured value as work is reported in the Statement of Profit [loss]. Expressed rights as ownership is reported in the Balance Sheet. Value differs from rights as physical behavior differs from intellectual identification. Pacioli’s cash-value is a concrete role played by gold or silver; capital-rights is an abstract rule set by political policy. The debtor’s share of the purse paid in gold or silver, trades physical artifact-value for physical gold- or silver-value. Creditor-rights test a creditor’s intellectual decision to buy potential value that may or may not be made real in use, or in future trades. Book-keeping numbers that measure physical-value are never commingled with credit-numbers that express intellectual-rights, hence Pacioli documents the two column ledger-architecture shown below. Debtor numbers coincide with cash value; creditor numbers coincide with capital rights. These paragraphs are cut from my future book. The book hopes to take the reader through the history of book-keeping, the ledger form changes as culture becomes more complex, to handle the greater complexity of an Industrial revolution for example, in the 19th century. When I programmed the model that I learned at GE in the 1950s into compute software code, the computer enabled far greater real-time powers than paper systems could ever hope to deliver. What is happening today, because professionals do not understand the book-keeping language, is that the power of the computer, in place of making the culture more informed, is being used to make the culture more confused. It is work to learn how the language works, and even more work to program it into software code. A lot can be done to stem the tide of book-keeping’s misuse if persons like yourself take a proactive role in rooting out professional ignorance. Silke, Double-entry book-keeping was refined into practice 150 years before Pacioli documented the language in 1494. See Raymond de Roover’s Rise and Decline of The Medici Bank. Double-entry book-keeping was in common use in Italy when Pacioli documented the language for the Catholic Church. The church was interested in extending its reach through an international banking system. That system needed book-keeping in order to work. I side, on this, fully with cityislander. Clearly there are a lot of computing and accounting problems in banking; like the delays in registering many of the derivative contracts and which clearly opens up the possibility of unknown risk positions of the banks; like the discussion on how to value assets mark to market and other; and with respect of the existence of sufficiently safe backup system so that we are not submerged into a paperless chaos. But, with respect to confusions on double entry, there are none, in the real world, except of course for the normal confusion present in some introductory classes of accounting. Want to know what double entry is? Go to Wikepedia… and move on. I also believe we should favor a very small Tobin Tax, meaning a little bump that slows the speed of the financial traffic, as an incentive to force financial decision making to have a second of a second thought. That is a thousand times less risky than the capital requirements for banks based on risk which do not slow down any traffic but diverts the financial traffic into areas of interest exclusively to bank regulators, those contain a lower perceived risk of default. If a were a progressive I would much more prefer those financial funds to be diverted not based on default risk but based on how useful they could be to society … like in decent job creation, adaptation and mitigation of climate change and what have you. If I was a conservative I would hold let the markets be free markets without regulators building channels where funds must flow and allowing the land of the brave continuing to be brave and willing to take on risks which is what drives the world forward. While on this I must express my surprise that regulators could have so much power to decide on their own that the banks if they invest in some activities need only 1.6 percent or even zero equity while if they invest in others they must come up with 8 percent or more. Talk about illegitimate “death-panels”! if this is true than NYT’s Gretchen Morgenson and others could not have reported for a long time now that banks do not know what is on their books. Thus I conclude there is something wrong with their accounting and if you want to mess up office procedures you’ll have best success when you fiddle with the very first steps. Well that is overstating it a bit but it goes something like this. You count it all from the front with your right hand fingers, and then you count it all from the back with your left hand fingers, and then you see how many right hand fingers have been counted and compare it to how many left hand fingers, and if the numbers match you feel more comfortable you are getting it all. I understand that this is happening today, but one cannot brush it aside based upon the shallow book-keeping literature one finds in Wikipedia. To a person like me, who has practiced and studied the art for 30 years, the wikipage is a joke. It reflects that proper book-keeping is a lost art in today’s business culture. And our mess will not resolve itself in any durable way without our return to the proper book-keeping methods. Dan, buy four paintings of Rembrandt, Cezanne, Picasso and Andy Warhol. Cut all of them in four pieces each and glue all the pieces together in four new paintings. Have an art expert declare the four new pieces the wonders of the world of art… and then call your accountant to register the value of those four new paintings… whether he uses one, two three or how many bookkeeping entries system you want… your accountant is going to have great trouble doing it. Per, in double-entry book-keeping the accountant does not register the price of an asset. An artifact’s value is set by the market price of the artifact in its trade price. Book-keeping is recording a history of fact. An artifact that has increased or decreased in value since the time of purchase the entity can legitimately show that increase or decrease of potential value as part of its net worth if there is reason to do so. Your example hardly fits any such criteria, since the original paintings purchased at great expense were reworked into something of such unique value that only the marketplace will tell the accountant what the asset is now worth. Are we talking of accounting or are you talking of something else? Of course in double-entry book-keeping the accountant does register the price paid for the assets? And this applies perfectly to those securities backed by the mortgages to the subprime sector made even worse by the fact that at some moment there was not even a market for these securities. But here I jump of this issue double entry issue of yours Dan since there you might have something else on your mind that I can’t comprehend or you can’t explain. This restores my faith in Chairman Greenspan. One has to give him credit for admitting that he was oh so horribly wrong. But how does one counter the patter of the chattering class that insists that U.S. banks need to be huge to be competitive with foreign banks and to service global corporate behemoths? Data please. If I set out to build and sell a house, I, or my accountant, can set any price we wish on our proposed value of the property. However, the market will decide what that price will be if and when the house is sold. From the book-keeper’s position, the only price that counts is the one that the house sold for. If that is what you mean by “The accountant registering the price of the asset,” then we are in agreement. That banks created artifacts that have no market makes it pretty clear that the value of the mortgages at that point in time is near zero. The mortgage owner has little choice but to hang on and wait for a market to form. Any comment on Antonio Salazar? IIRC, he was an obscure finance professor in Portugal who found himself in the Portguese cabinet. This was a time when Portugal was the “Sick Man of Europe:” massive budget deficits, rampant inflation, and years of political chaos. If I remember the story correctly, Salazar reformed the government accounting system such that the Portuguese government was able to balance its budget for the first time in 30 years. After achieving this impossible feat, Salazar was clearly qualified for the post of President for Life, which he held for most of his remaining life.